By what authority do historians give GREECE credit for the origin of modern medical practice? This question may come as a surprise. Most early men of learning taught that ALL civilization began with a single people: the ancient Greeks. Until the Twentieth Century, few students of medical origins have thought to question seriously this commonly accepted theory! In spite of advanced knowledge of discovery, it continues to be generally conceded that competent, modern medical procedures had their earliest beginnings in Greece some 2,500 years ago. In accordance with this out-dated theory, Hippocrates is labeled the Father of Medicine! When in reality, we now know this is more tradition than fact! Through exhaustive studies of ancient civilizations — those of Egypt, Mesopotamia, India, China, and Latin America — historians in the late 1800s gradually began to understand a most revolutionary fact: CIVILIZATION DID NOT BEGIN WITH GREECE, but with other, more ancient nations! This was an unexpected bolt that smashed many a cherished hypothesis. What would this discovery mean to the accepted treatment of Medical History? Would a simple alteration be sufficient — or was a new structure necessary? Only time and further investigation would tell. As important as this revolutionary new view of the origins of our present civilization was to general history, it did not, and alone, could not, alter the already assumed historical traditions about the origin of medicine. Serious work had yet to be done in the field of ancient medicine before the confusion could be unraveled. And the problems to unravel were many! In the first place, artifacts of the most ancient medical practice were destined to remain buried under the debris of bygone civilizations until this century. Gradually, certain material destined to alter present tradition was discovered. The first records to receive serious attention came in the form of Egyptian papyri. The papyri form the basis of the secular literary record of medicine from the most ancient times. The most notable of these discoveries are the Ebers Papyrus (1862), the Ramesseum Papyri (1894), the Kahun Papyrus (1889), the Hearst Papyru (1889), the Edwin Smith Papyrus (1862), the London Medical Papyrus (1860), and the Carlsberg Papyrus (Singer, Science, Medicine and History, pp. 49-52). Clearly, the importance of these documents initially was not understood! In the case of some papyri, it was not even recorded how, or exactly when, authorities came to be in possession of them. It is important to note, however, that from the available records there is no indication any medical papyri were discovered prior to 1800! Of this group, the Ebers Papyrus is perhaps the most important discovery to date. Discovered in 1862, its importance continued unnoticed for another 11 years until purchased in 1873 by Georg Ebers, a nineteenth-century German professor. After reading but the first few lines, he immediately grasped its significance! Here was an important book about early medical practice! For the introductory phrase stated: "Here begins the book on the preparation of medicine for all parts of the human body" (see Ebbell, The Papyrus Ebers: The Greatest Egyptian Medical Document). This was a medical textbook full of many unintelligible words — but obviously containing many prescriptions. In addition to the medical text, there were calendar calculations, which dated the contents to at least the 1500s B.C. Immediately Eber's mind recalled the words of Flavius Clemens, a professor in Alexandria, who wrote in 200 A.D., that the scientific and technical knowledge of the Old Kingdom of Egypt (2254-1993 B.C.) had been recorded in an Encyclopedia of forty-two volumes. Six of these books were reputed to contain everything known about anatomy, physiology, pharmacology, surgery, and gynecology (see Bryan, The Papyrus Ebers, pp. 3-4). These were later to be called the Hermetic books — after the Greek god Hermes. In spite of Eber's personal interest in this manuscript, the first attempt at translation took place over fifteen years later in 1890. This translation was weak and incomplete, but confirmed Eber's contention that it was an important medical treatise! However, once fully into the translation, it proved not to be a Hermetic book, but rather an XVIII Dynasty "copy of a series of books many centuries older" (Singer, Science, Medicine and History, p. 49). Suddenly, after many centuries of mystery and doubt, a significant medical practice in ancient Egypt had been revealed! Interest was kindled — work was to begin on its interpretation in earnest. Apparently Greece was not the mother of medicine after all! However, it was not until 1930 when Professor J. H. Breasted of Chicago published his translation of the Edwin Smith Papyrus that such papyri were unquestionably demonstrated to be reproductions of more ancient texts. The Smith Papyrus, like the Ebers Papyrus, contained expressions, which were no longer in current usage by Dynasty XVIII, but rather dated from the Old Kingdom — PROVING that the original documents belonged to the earliest era of Egyptian history. The Smith Papyrus was adequately translated by 1930, but it was not until 1937 that a Danish Egyptologist, Bendix Ebbell, finally rendered a satisfactory translation of the Ebers Papyrus. Even Ebbell's work was to be improved by a team of Germans in 1957 (see Thorwald, Science and Secrets of Early Medicine, p. 59). As noted above, the facts of ancient medical history have laid buried until recent times. Once exhumed they initially did little practical good! It was impossible until within the last thirty years to produce a responsible translation. The world lacked an Egyptologist with sufficient pharmaceutical knowledge to express in modern terminology ancient chemical data. When these qualifications became available, real headway was made in ascertaining the quality of ancient materia medica. The papyri only give a limited explanation of how disease was treated. Paleopathology, another modern means of determining the facts of ancient medical history, presents the amazing picture of just which diseases were extant to treat! In 1893 Dr. Armand Ruffer, a French physician, arrived in Egypt. His education and interests lay in the then infant field of bacteriology. Once in Egypt he became interested in a unique facet of that nation's history — mummification. His investigations proved that an intensive study of the remains of men who lived and died centuries ago provided an intimate knowledge of the diseases encountered during their respective eras. It is from this recent work, reliably developed since 1910, that we know what ailments were common to these ancient people. It becomes obvious how recent the significant technical research in this field has been. Actually, very little of it occurred over forty years ago. The upshot of this revolution in the facts of medical history is that material written on the subject prior to 1930 is incomplete at best — and virtually rendered null and void! Any work done since 1930, which has not fully taken into account recent discoveries, is also misleading and incomplete. To express the full impact of ancient medical history, ALL recently developed material must be included! History is more than the simple recording of facts. It is essentially an interpretative art. "The reconstruction of ancient history is an abstracting from the facts by means of hypothesis... " (Wright, The Biblical Archaeologist Reader, p. 19). The present abstract of MEDICAL HISTORY is a tragic shame. BOTH THE FACTS AND A PROPER HYPOTHESIS HAVE BEEN MISSING! Laboring under the delusion that the ancient Egyptians were a primitive people emerging from the mists of antiquity, it has been previously impossible for the historian to ascertain from the simple facts of history, the significance of ancient medicine. Ancient efforts at the control of disease have been considered, as late as 1945, to be nothing but primitive experiments in witchcraft — sewer pharmacology at best! In respect to medicine, it was assumed that mankind had remained blind, deaf, and dumb until 300-400 B.C. — the flowering of Greece (see Robinson, The Story of Medicine, pp. 1-10). After all, historians mused, had not men watched the sun rise and set for a million years before Copernicus saw the significance of this daily phenomenon? Had not apples fallen a billion times before Newton grasped the laws of gravitation? These two comments are, of course, written with tongue-in-cheek, yet, they do accurately picture the viewpoint of evolution expressed in current writings. The historical method based on this theory of evolution is the patent HYPOTHESIS of historians: i.e., that God or other supernatural power has never intervened in the course of history! Twentieth-century historians have fully accepted the theory that man, apart from and without the supernatural, has evolved from an ancient primitive culture to a modern advanced civilization. So, students today are presented with a radically new interpretation of history — a history in which God and the supernatural are summarily rejected! This is particularly applicable to the treatment of Medical history. Every effort is made to separate "scientific" medicine from what is depicted to be a sort of witchcraft which flourished millennia ago. What many do not realize is that the modern World-view of history [medicine included] without God is a radically new interpretation of human experience. Almost no one today, it seems, has ever questioned whether this new interpretation is right. It is merely assumed to be right (Hoeh, Compendium of World History, pp.1, 2). Let a modern exponent of this new approach explain it: "... the modern study of history... does not take into account any intervention of God or of the devil or of demons in the course of history..." (Bultman, Jesus Christ and Mythology, p. 17). This assumption has never been proved. It remains only a hypothesis! Nevertheless, "students in particular — and the public in general — have been led to believe that archaeologists, historians, scientists, and theologians live with full assurance and in absolute conviction that this new interpretation of history without God is correct" (Hoeh, Compendium of World History, p. 2). The application of this premise to medical history is a fatal blow! Without considering God, the Bible and the supernatural, it is impossible to come to an intelligent understanding concerning the origin of this practice, and the importance of its history to mankind! Yet, we are "taught to reject everything supernatural from history texts — even when evidence of the intervention of God [or the supernatural] is recorded by eyewitnesses in ancient secular records" (Hoeh, Compendium of World History, p. 12). This unscientific approach to history is the universally accepted method of study. Since supernatural occurrences in history cannot be scientifically tested today, they are rejected as myth. Any statement referring to supernatural intervention is assumed to be mythological, therefore worthless! Anyone seriously asserting such intervention "must be regarded as ignorant, superstitious, the victim of hallucination or some other form of mental aberration" (Hockett, The Critical Method in Historical Research and Writing, p. 62). No one wants to be ridiculed. As a result, the ancient records, which substantiate, in this case, the truth of medical history and the record of the Bible have been rejected as fabulous or mythological. There has been no true respect for the history of the Bible and for accurate [ancient] secular annals. This suppression of part of the truth is the primary reason the world has never learned the lessons of history (Hoeh, Compendium of World History, pp. 5,16). The charge that ancient medicine prior to Hippocrates either originated with, or was limited to, meaningless mystic incantations of a superstitious people is false! The exposure of this myth is overdue! It is time to learn the lessons that lie hidden in the ruins of ancient civilizations. Hippocrates was not the father of Medicine! Furthermore, HE KNEW IT! Notice the Hippocratic Oath to which Hippocrates, himself, reputedly ascribed: "I [Hippocrates] swear by Apollo Physician, by Ascalepius, by Hygieia, by Panacea, and by all the gods and goddesses, making them witness..." (Marti-Ibanez, The Epic of Medicine, p. 65). Hippocrates swore allegiance to earlier practitioners of the healing art. He knew full well that the practice of medicine did not begin with him. Greece was not the origin of medicine — Hippocrates not its originator! Rather, he lived about the middle of the medical history experienced by mankind (ibid., p. 50). In fact, altogether too much importance is placed on Hippocrates. He is a ghost of history, a semi-fictitious character of ancient Greece — about whom we know precious little! "All that we actually know of him as a man can be told in a few short sentences. He was born on the island of Cos about 460 B.C. He was a member of the Guild of Aesculapidiae, those men who claimed descent from Aesculapius.... He is said to have died about 360 B.C." "If so little is actually known of Hippocrates, how does it happen that we credit so much to him" (Haggard, The DOCTOR in History, p. 67). This is a valid question for which there is no satisfactory answer! Another author writes: "We know little of his life — even less than we know of Christ's youth — YET Hippocrates of Cos has passed into History as the Father of Medicine. Like... Socrates, HIPPOCRATES NEVER WROTE A WORD..." (Marti-Ibanez, The Epic of Medicine, p. 49). The assertion that Hippocrates is the Father of Medicine is indeed more tradition than fact. The truth is that "modern" medical practice long antedates his era! By 500 B.C., medicine had passed its ancient apex and had degenerated greatly from previous heights of worldwide acclaim. "The decadence of the arts and sciences [from the time of the earliest Egyptian dynasties] was accompanied by a deterioration of medicine also. Even though the new conquerors tried to preserve the ancient traditions, and even though later, in the period of the Ptolemies [3rd century B.C. ], there are found traces in medical practice of these ancient traditions, nevertheless, EGYPTIAN MEDICINE DETERIORATED and became merely a trade of sorcerers, drug vendors, and charlatans who preserve only the mystic vestments of the ancient medicine" (Castiglioni, A History of Medicine, p. 62). Writing on the same subject, another author comments, "Only near the end did the latter [empirico-rational medicine] veer toward magic" (Marti-Ibanez, The Epic of Medicine, p. 38). 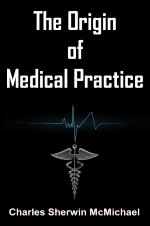 Egyptians studied medicine and surgery in the medical colleges of Babylonia and in parts of Mesopotamia, and acquired a complete knowledge of all the Oriental medical practices" (Selwyn-Brown, The Physician Throughout the Ages, p. 34). It was from this world-renowned medical practice prior to its deterioration, that the Greeks IMPORTED their knowledge of medicine. It is most important to remember that the most ancient scientific documents are MEDICAL and mathematical... there existed a scientific tradition that was already old when Greece was young. Pythagoras, Thales, and Hesiod in the sixth, seventh, and eighth centuries B.C., respectively, linked their work on mathematics with the old Egyptian theories. The Iliad... grants credit to Egypt as the place of origin of Greek drugs.... The [comparatively recent] Egyptian texts [we have now] are merely copies of ancient texts made when Egypt's sun was already setting (Marti-Ibanez, The Epic of Medicine, p. 37). This explains the inferiority of the texts — including their bent toward witchcraft and superstition, which is evidenced in all nations from about 800 B.C. Until recently, the high degree of development which medicine had reached over 4000 years ago, was never remotely suspected! Had it been known, virtually all medical knowledge up to the accidental discovery of penicillin by Alexander Fleming in 1928, would have been put to shame (see Ratcliff, Yellow Magic, pp. 3-25)! In 1928 chemotherapy was in disrepute. As many books had been written against the use of drugs to cure disease as had been written in favor of it. However, in the wake of the discovery of penicillin, there followed a veritable stampede to find new drugs to fight disease. The field of chemotherapy was suddenly wide open! Cure with chemicals became the great hope of man's endless war against disease. Research men in every country were hot on the trail of substances, which would destroy bacteria. It seemed penicillin was the destroyer researchers had been seeking since the discovery of microbes. With this discovery, today's physician now possessed, for the first time, an effective means to combat the spread of bacteria. The AGE of the ANTIBIOTOC was born — the cornerstone of modern drug therapy! As astoundingly revolutionary as the discovery of antibiotics seemed in 1928, this principle of today's drug therapy was not new! The operational principle of antibiotics was common knowledge among physicians 4000 years ago! Furthermore, history records that ancient physicians used the drugs with greater accuracy than do their medical counterparts today. Astounding, but this will be proved true in Chapter IV! The words of Solomon, in whose day this medical practice yet flourished, certainly rings true: "The thing that hath been, IT IS THAT WHICH SHALL BE; and that which is done is that which shall be done: and there is no new thing under the sun" (Ecclesiastes 1:9). No, Hippocrates was not the Father of Medicine. Greece was not the origin of modern civilization. The records now available prove this all too conclusively! Scientists now realize medicine is of much greater antiquity than previously believed. All medical histories, except for the most recent scientific annals, are out of date. The origin of medicine occurred in Egypt forty centuries ago. It was there that the concept of, and need for, a competent medical faculty was born. The Aesculapians of Greece and ALL subsequent medical societies must pay homage to Egypt!